Cells accumulate DNA damages that would be repaired to survive. 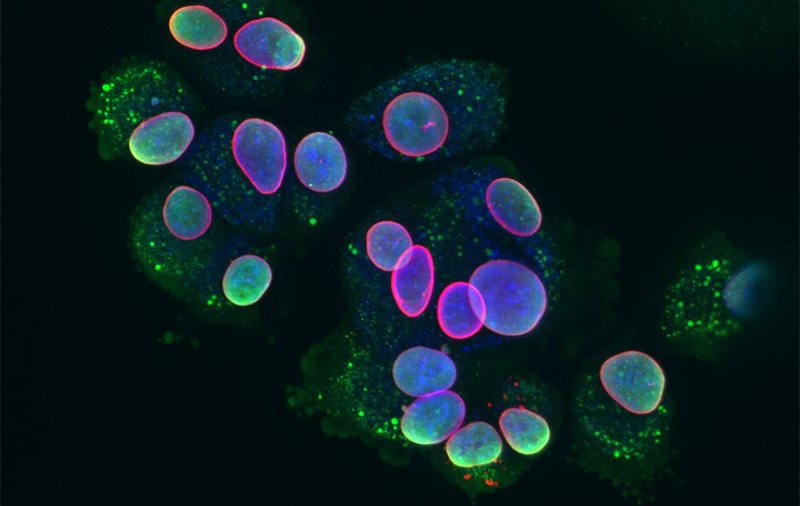 The PARP inhibitors block one of the system cancer cells use to repair their DNA. So, the number of damages inscreases more and more until the cancer cells die. This mechanism shows how PARP inhibitors can destroyed precisely cancer cells with DNA mutation, like BRCA1 (ovarian, breast and prostate cancers) or ERCC1 (lung cancers). Recently, a researchers team, led by Dr. Sophie Postel-Vinay from Gustave Roussy and Prof. Chris Lord from The Institute of Cancer Research, found a new potential for PARP inhibitors to boost the immune system against the tumor. The researchers found that lung cancers with deficiencies in their DNA repair contained significantly more immune cells within the tumours, compared with tumours in patients with a functioning DNA repair system. This suggested that the DNA repair mutations were stimulating an immune response against the tumours. Studying cancer cells from non-small cell lung cancers and triple-negative breast cancers with mutations in DNA repair genes such as ERCC1 or BRCA, the researchers revealed that the accumulation of DNA damage in cancer cells treated with PARP inhibitors triggered the release of various molecular signals that have the potential to attract immune cells to the tumour. "We knew PARP inhibitors can kill precisely cancer cells with damages by blocking DNA repair. But our study showed that PARP inhibitors help immune cells to infiltrate the tumor, influencing interaction between tumor cells and their immune microenvironment" explains Dr. Roman Chabanon, PhD in Oncology - Philanthropia Foundation - and biologist responsible of this research project. "The findings of this study substantially change our perception of these drugs potential." The study opens up a new way of treating cancers using PARP inhibitors alongside immunotherapy. Dr Sophie Postel-Vinay, clinician scientist and medical oncologist at Gustave Roussy, said: "Our study found that PARP inhibitors enlist immune cells to aid in the killing of cancer cells. This provides a rationale for using PARP inhibitors alongside immunotherapies to further stimulate the immune response to cancer cells with DNA repair defects and enhance the therapeutic benefit of the treatment. This will be evaluated in a clinical trial that we developped which will associate a PARP inhibitor with immunotherapy. This clinical study will start at Gustave Roussy in 2019, enrolling patients with lung, prostate and bladder cancers." Their study was funded by the Inserm ATIP-Avenir programme, SIRIC Socrates, the Philanthropia Foundation and Cancer Research UK and is published in the Journal of Clinical Investigation.